The company contests Apple has the rights to the name world-wide, and has amended a California law suit to take that into account. Proview claims Apple Inc deliberately misrepresented why they wanted the trade mark when it negotiated to buy it in 2009. Proview is a maker of LED lights and registered the name in 2000 when it unsuccessfully launched an “Internet Personal Access Device”. It then sold the IPAD trade mark globally to a company specially set up by Apple for just $55,000. The Taiwanese company says it still holds the rights to the name in mainland China, and has been seeking compensation from Apple in the courts there. An appeal by Apple Inc is to be heard in a Chinese court on Wednesday February 29, after a lower court ruled against the American company. Proview is a company which has been suffering in the downturn, and has large debts. Last year the Hong Kong Stock Exchange stopped trading in its shares, and could be de-listed in July. Apple Inc has sold 15 million tablet computers in China, earning it about $10bn, almost half the company’s 2011 revenue of $20.4bn. 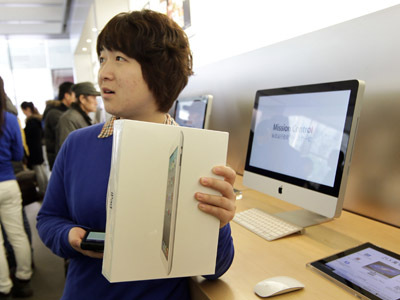 Last December the Chinese agency Xinhua estimated the iPad trademark in China to be worth $1.6bln. Should this new move by Proview be successful, and the 2009 sale to Apple be considered void, the company would have the rights to the iPad name returned to them in the EU, South Korea, Mexico, Thailand, Singapore, Indonesia, and Vietnam.